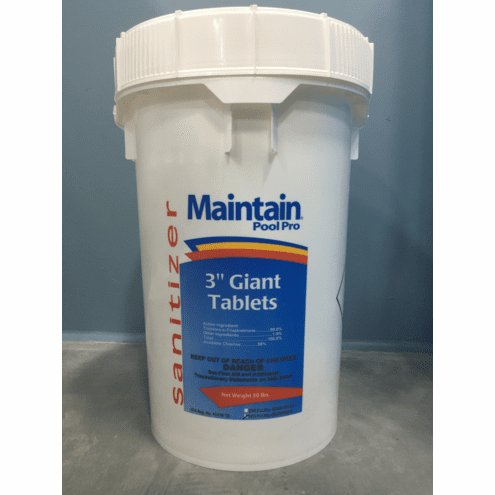 Maintain Giant 3" Chlorine Tablets are slow-dissolving 8 oz. tablets that offer 90% available chlorine for effective sanitizing. This product is an ideal way to continually sanitize pool water. They are perfect for dispersing with floaters, automatic feeders, or skimmers. These large tablets dissolve slowly and at a uniform rate, eliminating the need for frequent hand feeding of granular or liquid chlorine. They are also stabilized against the sun's UV rays which break down chlorine. Stabilized chlorine means less sanitizer consumption.